Today, cooking strenuously through my farmers' market folly, I made cauliflower soup and also Eggplant Caponata according to a recipe Art emailed me. We are both in a panic since our shopping expedition. We cannot wait to find recipes in books. The cauliflower soup used up a cauliflower, two carrots, an onion and a potato. The caponata: two eggplants, two peppers, two onions and a package and a half of mushrooms I bought at Jubilee when I went out to Amherst to see my mom a few days ago. That is pretty good! All that stuff, used up! Art, working fast, made a pear tart and a plum galette. 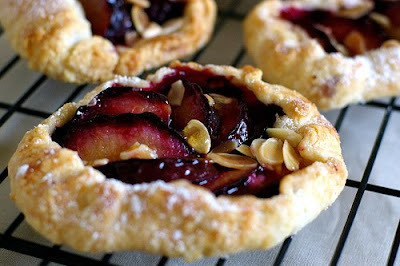 That is Art's plum galette pictured above. Good going, Art! Nice work! Both of us showed restraint in the potato department or else we may have been reduced to building a potato cannon. Someone in Buffalo did that and it is one of The Buffalo News' most-read stories today. I bet that person was desperate after a trip to the Clinton-Bailey Market! In the department of situations you get yourself into, this morning I went to Mass totally forgetting about that I have these rubber bands in my mouth. They are like the ones in this picture. That is how they look and that is how far I can open my mouth when I am wearing them. This morning was the Mass for Leonard Pennario as I may have alluded to earlier. I guess I was distracted by that and I forgot about my band situation. I guess I have been getting used to my mouth being rubber-banded shut. Anyway it never occurred to me. Until I was at the Communion rail and the priest was standing right in front of me! He was reciting the Latin words and that was when it suddenly, finally, occurred to me that here I was supposed to be receiving Communion but I could not open my mouth. Ahem. Houston, we have a problem! The priest was a guest priest filling in for Father Secondo. He is Father Bialkowski from Our Lady Help of Christians. I had no idea what to do so I just put out my tongue and hoped for the best. I can get my tongue between my teeth and out of my mouth if I am careful. You could sort of see Father Bialkowski hesitate. What in the world, he must have been thinking. What now. But he gave me Communion and I moved my tongue really fast back into my mouth and somehow all went well. Thank God! That was a tense moment! These things you do not think of. I am telling you. After Mass I was surprised by my Facebook friend John Callahan. He showed up! For the Leonard Pennario Mass! Plus, his Facebook page says he went to two church services today. That means he tacked on an extra one because of me. John, thank you! My Facebook friend John Callahan introduced himself and then he said apologetically, "I know you can't talk." "John, I can talk," I said. "We're allowed to talk now." Meaning, now that the Mass was over. I thought that was what he was talking about. But he said, "I meant because of the bands in your mouth." I forget all about them! There for a minute, I was thinking that Art's plum galette was a modern art painting. Glad the mass went well! That wasn't actually Art's galette. I just stole it off the Internet somewhere. Now I want to make it!